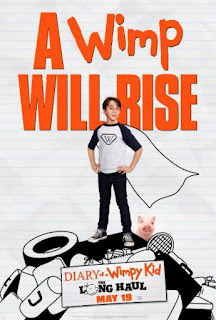 After three successful and entertaining films, the DIARY OF A WIMPY KID franchise gets a soft reboot with a completely new cast in DIARY OF A WIMPY KID: THE LONG HAUL. This, perhaps not surprisingly in our internet age, has spawned a fair amount of backlash from some fans, proving once again that people have way too much free time and spend far too much of it getting worked up over insignificant nonsense. The film can be summed up succinctly as "A family friendly take on NATIONAL LAMPOON'S VACATION". There are also a few bits and pieces from PLANES, TRAINS, AND AUTOMOBILES and A CHRISTMAS STORY thrown in for good measure as the Hefley's take a cross-country road trip to their Mee Maw's 90th birthday party. Where the film carves out its own territory is in a couple of contemporary subplots dealing with modern technology. Greg (now being played by Jason Drucker) really wants to meet his favorite youtube celebrity, Mac Digby (Jason Hoover). And in a what most modern parents would recognize as a futile effort, Greg's mom (now being played by Alicia Silverstone) tries to keep her family unplugged from their various devices for the duration of the trip. Having a six year old myself, I can relate to both of these aspects, and appreciated the smart and funny way the film dealt with them. There's also a running subplot about another vacationing family (dubbed the "Beardos" by Greg) coming into conflict with the Hefley's. This is more typically goofy, unrealistic movie comedy/sitcom stuff, but it does nonetheless provide some laughs. As in the previous installments, the film is told from Greg's point of view, but there's still plenty of room for his annoying wannabe rock star brother Rodrick (Charlie Wright) to take the spotlight. Mom, Dad (Tom Everett Scott), and youngest Hefley Manny (Wyatt and Dylan Walters) are definitely relegated to support roles, but Silverstone and Scott each get a few moments to shine. Not like this movie is intended as an acting tour de force for anyone, of course, but the cast are likable and possess good comic timing. Not much more they need to do, really. Like the rest of the WIMPY KID movies, LONG HAUL is by no means a great film. I've seen some reviews pish posh about the film being heavy on the three p's of comedy (poop, pee, and puke), and for being "too slapstick". Tell that to the Farelly's or the Three Stooges. You either like that kind of humor, or you don't. Me, I like it. And in my experience, so do most kids. Either way, you should have a fair idea of what to expect from this review, and can decide whether you want to spend your movie dollars accordingly. 3 out of 4 stars.